Abundant sunshine. High 89F. Winds light and variable..
Clear skies. Low 57F. Winds ESE at 5 to 10 mph. There's more to the Arizona guard than you think. 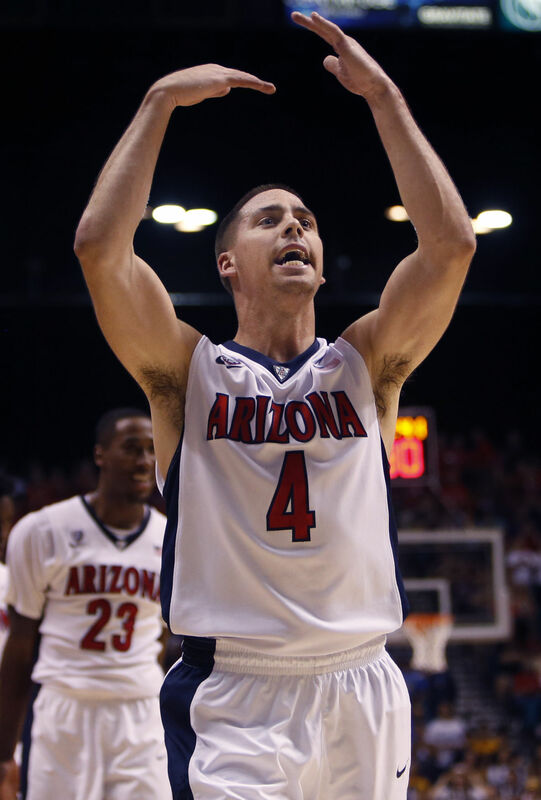 It's no secret that T.J. McConnell became an Arizona Wildcats fan favorite in the two years he started at point guard. He charmed fans with his smile, got his teammates and the crowd pumped up with his priceless facial expressions and emotions and showcased his aggressive style of play on a daily basis. And, not to mention, he's got the heart of a lion. But there's also probably a handful of things you don't know about the guard from Pittsburgh. Here's a rundown of all the things that make T.J. T.J.
First things first, let's start with McConnell's real name. What does T.J. stand for? McConnell's full name is Timothy John McConnell Jr. He is named after his father, who goes by Tim. Timothy John — or T.J. — stands at 6 feet 1 inch tall and weighs 195 pounds. T.J. was born on March 25, 1992 in Pittsburgh, Pa. He's 23 years old. McConnell attended Pennsylvania basketball power Chartiers Valley High School and was coached by his father, Tim, who is one of the most successful coaches in Pennsylvania high school history. During his senior year, McConnell went on a tear and led Chartiers Valley to the Class 3A state championship. Here's a look at his numbers that year. Honors: The Associated Press' Pennsylvania Class 3A Player of the Year. Pittsburgh Post-Gazette's male athlete of the year for all sports. First-team all-state. Not only is T.J.'s father involved in basketball, he actually comes from a well-known basketball family. T.J.’s aunts and uncles compose a literal Who’s Who of Western Pennsylvania basketball. One aunt, Suzie McConnell-Serio, is the head women’s coach at Pittsburgh, having been an All-American at Penn State who won an Olympic gold medal and played in the WNBA. Another aunt, Kathy McConnell-Miller, played in four NCAA tournaments with Virginia and coached at Tulsa and Colorado — and now has joined her sister as Pittsburgh’s associate head women’s coach. Then there's an uncle, Tom, who played at Davidson in the early 1980s and was the head coach at St. Francis (Pa.) for seven years in the 1990s. And then there's another aunt, Maureen, who played at Pitt from 1989 to 1991, just when Miller happened to be playing for the men’s team. Sean Miller and Tim, T.J.'s father, have known each other since childhood, performing ball-handling tricks together at the University of Pittsburgh games as members of the “Little Panthers” group. While Sean Miller went into college coaching after his playing days with Pitt, Tim McConnell played ball at NAIA Waynesburg (Pa.) College, then settled on high school coaching. Before coming to Arizona, McConnell played at Duquesne for the 2010-11 and 2011-12 seasons. When Duquesne came to Tucson to play the Cats on Nov. 9, 2011, Arizona head coach Sean Miller took notice of McConnell's lockdown defense, desire to win and gritty attitude. McConnell would eventually transfer to UA at the end of that season, in April of 2012. It's no mystery why Sean Miller wanted McConnell for his squad — the Pittsburgh kid's got skills. Here's a look at the numbers he posted his freshman year at Duquesne. Honors: 2011 Atlantic 10 Rookie of the Year. 2011 collegeinsider.com Freshman All-America. 2011 ECAC Rookie of the Year. 2011 Atlantic 10 All-Rookie Team. During his sophomore season — the year Duquesne played Arizona at McKale Center — McConnell's stats only got better. Here's a breakdown of his numbers that year. Honors: 2012 Atlantic 10 All-Defensive Team. 2012 All-Atlantic 10 third team. 2012 Atlantic 10 All-Defensive Team. McConnell officially transferred to Arizona in April of 2012. He had to sit out the 2012-13 season due to the NCAA's transfer rules. Ever since McConnell was able to begin playing at Arizona at the beginning of the 2013-14 season, he made an impact from day one. Here's a look at the most noteworthy stats and honors he accumulated during his two years at UA. Honors: 2014 Cousy Award finalist. 2015 Pac-12 tournament All-Tournament Team. United States Basketball Writers Association's 2015 District IX All-District Team. Lastly, on March 19, McConnell passed UA coach and former UA player Damon Stoudamire for the No. 3 spot on UA’s single-season assists list. “I guess that gives me some bragging rights,” McConnell said, smiling. He eventually finished the season with 238 assists, which is No. 2 on UA's single-season assists list. He finished the season behind only Russell Brown (247 in 1978-79).